C1134. 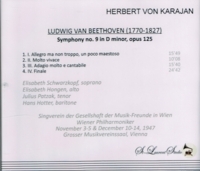 HERBERT von KARAJAN Cond.Vienna Phil., w.ELISABETH SCHWARZKOPF, ELISABETH HÃ–NGEN, JULIUS PATZAK & HANS HOTTER: Choral Symphony #9 in d (Beethoven). (Canada) St Laurent Studio YSL 78-032, recorded 1947. Transfers by Yves St Laurent.